Eight members of the Browne family immigrated to America from the Patrickswell area of County Limerick, Ireland during the great famine. Those immigrants were Honora Browne and her children, Patrick, John, James, Thomas, Ellen, Mary wife of William Henry Gray/Grey, and Johanna wife of Thomas Roach/Roche. This blog will be used to share family history, document past research and record future findings in the hope of preserving their story and perhaps connecting with other family members. movements for the ship, so, this may have been her second voyage. Notice the description of the ship – “First-Class Coppered Fastened Barque” of 700 tons burthen. Also, notice that the ship was being fitted to carry passengers where she had carried cargo on her previous and subsequent voyages. What is a barque, how large was the ship, and what accommodations did the family travel in? The average trip to America from Ireland was six weeks or about 35 days. That would probably have been a summer voyage. The Browne’s made a winter crossing, which made for a much different journey. 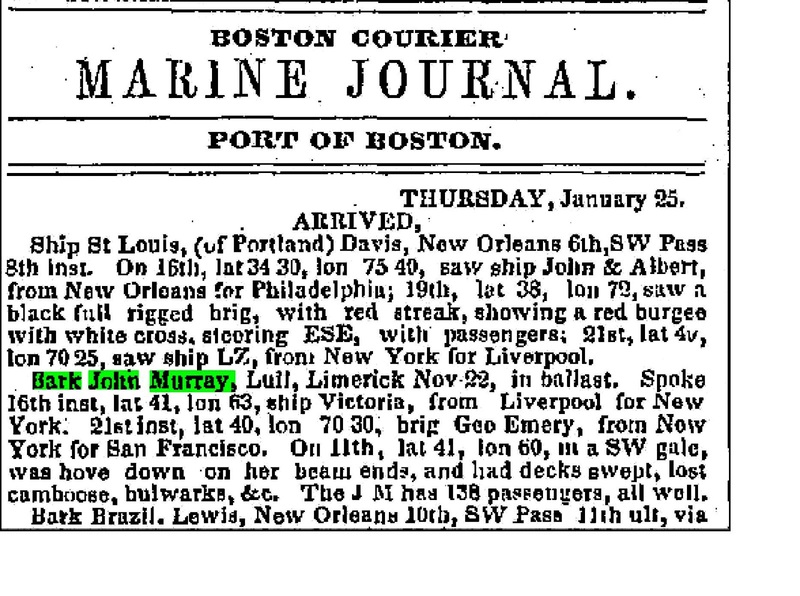 The John Murray left Limerick for Boston on November 15, 1848. Several newspapers, including the Athlone Sentinel and the Tipperary Free Press, carried news of her departure. 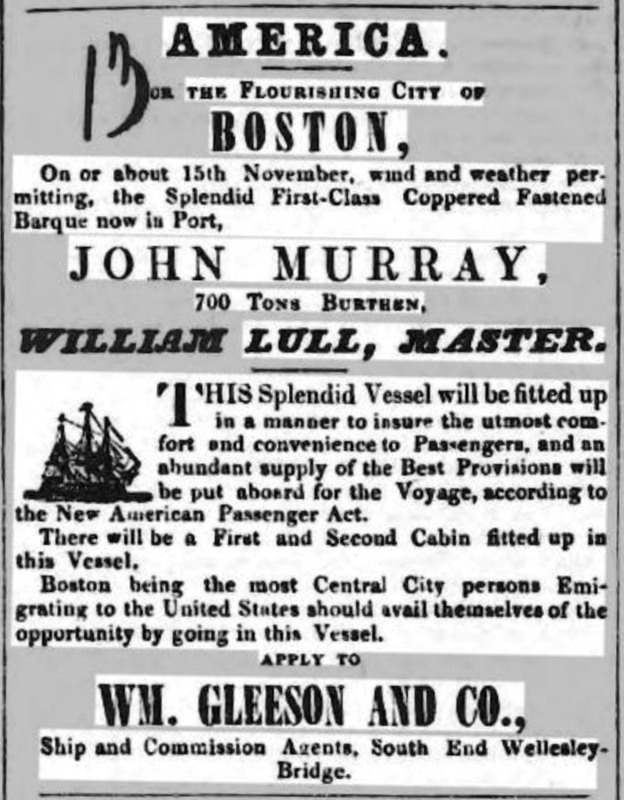 They also described the 130 passengers as “mostly of the better class of peasantry.”11 The John Murray arrived in Boston on January 26, 1849, a journey of 72 days - double the average. 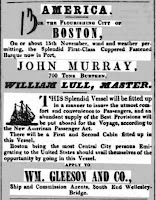 I have not been able to find other ports that the John Murray may have visited on that voyage to explain why it took so long to reach Boston; however, I have found information on the final stages of the journey. swept, lost camboose, bulwarks, &c.”12 (See image at left.) Several other ships in the vicinity also reported damage to masts and cargo. One report stated the storm raged for two days.13 In the same newspaper on the same date, under the heading “Died” is reported, “Lost overboard, January 11, during a S.W. gale, from bark John Murray, on the passage from Limerick to this port, James Davis, cook, (colored) of Exeter, N H., aged about 40.” A camboose [caboose] is the nautical term for a ships galley, or kitchen, on an open deck.14 Mr. Davis was obviously at his post during the storm that took his life. We have some idea of what those two days on the ship were like; we don’t know about the other seventy days. They still had two weeks before they reached Boston and had already been on the ocean 57 days. The John Murray ads in the newspapers always catergorized her as “fast-sailing.” What else happened on the voyage to make it take so long? American ships carried more and better rations, but, after so many days at sea, what food supplies were left, and, were they damaged in the storm? The ship nearly capsized, and probably would have had the ship not been new and strong. Equipment on a new ship would have been in better condition. An older ship, where the timbers were weakened by age, probably would have broken apart and everyone would have been lost. The competency of the crew also added to the outcome of the crossing. Sailors on American ships earned higher wages and were better seamen.15 So, while we initially questioned why an American ship was chosen over a less expensive British ship to Canada, I think we can be very glad they did or there may not be a story for the Browne family to be told. The next post will tell of the early days of the family in America. 2. “Boston Daily Atlas Marine Journal – Domestic Ports – Bath.” Boston Daily Atlas, Boston, Massachusetts, October 23, 1847, Online Nineteenth Century U.S. Newspapers available through the Cincinnati Public Library, Cincinnati, Ohio. 3. “Marine Journal.” Boston Daily Atlas, Boston, Massachusetts, Online Nineteenth Century U.S. Newspapers available through the Cincinnati Public Library, Cincinnati, Ohio; November 16th and 23rd, 1847; February 24, 1848, April 1, 1848, June 12, 1848, and July 26, 1848. 4. 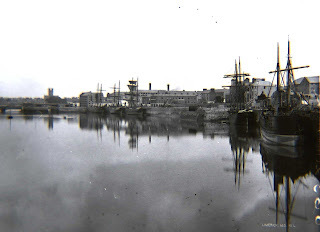 Picture of Limerick harbor, 663, Ancestry.com. 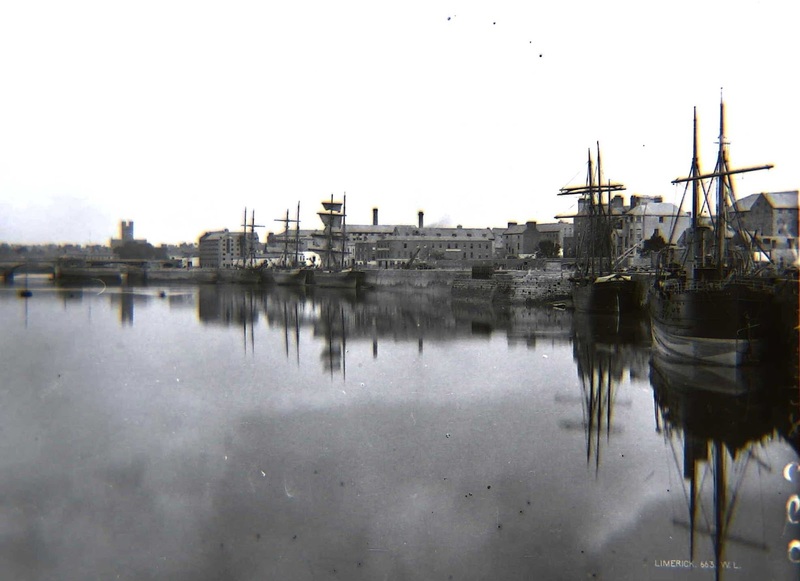 Ireland, Lawrence Collection of photographs, 1870-1910 [database on-line]. Provo, UT, USA; Ancestry.com Operations, Inc., 2011. 6. 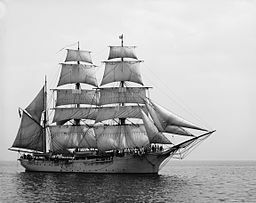 United States Library of Congress’s Prints and Photographs, digital ID det.4a25817, Unidentified sailing ship., http://hdl.loc.gov/loc.pnp/det.4a25817. Other copies of the image have identified the ship as the Salmon P Chase built 1878. She was 142 tons at 115 feet in length and 25 feet wide. 10. Lloyds of London Register of Ships gives a listing and description of ships sailing from British ports. It is available online at http://www.lrfoundation.org.uk/public_education/reference-library/register-of-ships-online/ . Beginning in 1863, in addition to tonnage, the registry began recording dimensions of the vessels. To obtain an average, I looked at the 1863 registry for “barques” built in the 1840s that were between 280 and 320 tons. While there were many such ships, I limited my calculations to fifteen randomly selected ships in that group. The John Murray was not shown in the registry for any year, perhaps because it was an American ship. 11. Athlone Sentinel, November 22, 1848, page 3. Available online at Find My Past. 12. Marine Journal, Boston Courier, Boston, Massachusetts, January 29, 1849, Online Nineteenth Century U.S. Newspapers available through the Cincinnati Public Library, Cincinnati, Ohio. 13. Reports for the Avon, Fanny, and Leander in the Boston Courier in the February 1st and February 8th issues tell of the damages sustained by those ships. Online Nineteenth Century U.S. Newspapers available through the Cincinnati Public Library, Cincinnati, Ohio. 14. Glossary of Nautical Terms, op. cit. The phrase “on her beam ends” indicated that the ship was above 45ᵒ or nearly vertical on her side. 16. Photo of the hold of the Dunbrody, September, 2012, from the collection of the author. The bunks on the John Murray would have looked similar, although they were but temporary structures while those on the Dunbrody were permanent. Each bunk was shared by four adults, more if there were children. Also, there may be more headroom on the Dunbrody than on other ships that had temporary living quarters. Mary Ann, this information is so fascinating and makes the story come alive. Thank you for your meticulous research. I am so glad that I am able to have access to this and to be able to enjoy learning more about the Brown family. Thanks for the kind comment. I have been able to find more than I ever thought possible - about the voyage and the ship. All of a sudden, information is becoming available. . . Thanks for the positive feedback. Hope the information helps in understanding the environment and issues our ancestors faced.